This world is full of people saying you have to fit into a category or something but please don't be sucked into being someone you're not to please others. You can't please everyone. You're not meant to. Someone in the world will find a fault in your perfection. That's the way it is. Our perfection is so different to other people's. And that's Ok. That's the way it's meant to be. What's special to us is different to others. That's how it's meant to be. Otherwise everyone would be fighting for the same thing. And it's good we're not. You just want to be noticed. You are being seen, by the people that matter. And right now, it's only your family and friends. And you wish it was more. But that's enough. Life gives us what we can manage. Just because you're not known all over the world yet doesn't mean you won't be. 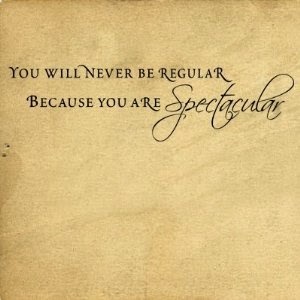 A film I was watching recently has the line 'Never Regular, Spectacular' from the film 'Jack' starring Robin Williams. It really struck a chord. It's true. Something that is part of everyday life for you, is spectacular, inconceivable or unbelievable to someone else. You think everything you do is just normal? Think of everything you've dealt with in your past to get you t now. That's pretty amazing. Please take pride in what you do. There is someone who you don't even know who thinks what you do is Spectacular. Someone is always looking up to you, don't let that person down.